Summary: Vane Weston should have died in the category-five tornado that killed his parents. Instead, he woke up in a pile of rubble with no memories of his past - except one: a beautiful, dark-haired girl standing in the winds. She swept through his dreams ever since, and he clings to the hope that she's real. My Thoughts: I started this one for the first time over a year ago. I wasn't sure what to make of it. I got about 50 pages in and stopped. It just didn’t hold my interest. I finally picked it back up and started over and gave it another chance. I’m so glad I did!! We are introduced to both Audra and Vane. Vane has just been a normal teenager and Audra has been watching him. She’s his guardian. She’s a sylph and Vane has a greater good. He is going to defeat a bad guy and make things right. What a joke, he figures. He’s not a fighter, the whole idea makes him sick. As Audra prepares Vane for the fight, they find themselves growing closer and wanting to be together. I really did enjoy this one a lot. I liked both of their personalities. I liked all the little details that were put into this one and their pasts and futures. I liked getting to know the other people in his life, even if it was brief. I enjoyed Audra and her mission. 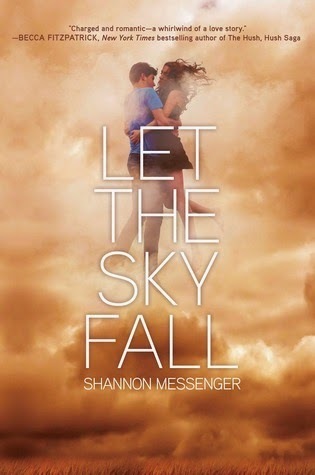 Let The Sky Fall was an interesting premise and I did enjoy it. I’m so glad I picked it back up and choose to start this series. Now I’m excited for the next one! Overall: It was a thick book but I enjoyed it. At times, it did get a bit slow but then it would speed right back up. I loved the whole idea of sylphs and I liked all the talk about wind. It was an interesting concept on something that happens every day. I’m excited to see what happens next for Vane and Audra! Cover: Its pretty! It would definitely catch my eye, and make me pick it up!